I also have the problem of post-grad primarily fiction reading, even though I have tons of nonfiction books from grad school on my shelves that I didn't read at the time and probably should get around to reading. I have found, though, that I often have more to talk about with others when I read nonfiction, and I've tried to bring it into my repertoire. I still mostly read nonfiction books that interest me, rather than "better" me. I've really been enjoying Bryson's A Walk in the Woods, but it's not particularly focused on inspiration. Other people I know love Mitch Albom's books, so those might be a possibility, but they're not for me. I'm so glad I read this post, and that you wrote it. I've been thinking for ages that my obsessive fiction book reading is a reaction to studying so hard for my graduate degree. My degree was in Modern Lit and Literary Theory, so a lot of that was fiction... but serious fiction. Not YA, like I've been binging on ever since. Now I'm kind of wondering if I too should be encouraging (okay, forcing) myself to read some non-fiction. And you know, I can't think of any non-fiction to recommend at all. Which means this isn't the most helpful comment I've ever left on a blog (sorry), but that I'll be really interested to see what you find. I don't read as much nonfiction as I'd like. Can I recommend Julian of Norwich? She was this amazing fourteenth-century Christian mystic, and her writings about her experiences of God are so great. A piece on non-fiction that I read recently that scared the crap out of me was Our Stolen Future. Yes, it was related to my major, but not required reading and I recommend all women read it. All of the other non-fiction on my shelf was either too boring to finish, or I never started it. Three Cups of Tea and Stones to Schools are great for getting inspired. I'm not a huge reader of non-fiction; I'm hoping to use my Gilmore Girls challenge to push myself more this way. Oh, man, there's so much great nonfiction out there! 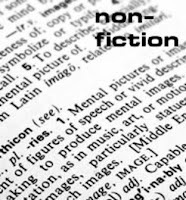 I read about 50/50 fiction and nonfiction. I like nonfiction about books (Library: An Unquiet History), travel (most books by Bill Bryson), science (Another Day in the Frontal Lobe), history (Confederates in the Attic). I can go on. And on. Also a fan of Sarah Vowell and Anne Lamott. Wait, so you're counting the Bible as non-fiction? Between those three books, you'll be bound to find something that'l stetch and interest you. When it comes to nonfiction, I'm a firm believer in humor. I've tried reading the political nonfiction out there-Ann Coulter, Michael Moore, Naomi Klein--and it's not that appealing to me. The funny stuff, though, is pure gold. David Sedaris, Sarah Vowell, and Jonathan Goldstein are each worth their weight in said gold. Oddly enough, I find that fiction, more than nonfiction, inspires me to consider what it means to be a good person. When I read nonfiction, I'm hoping to gain a greater understanding of a particular topic. When I read fiction, I'm hoping to place myself in the characters' shoes. The latter gives me more leeway to explore my reactions to particular situations and to consider notions of goodness and what it means to be human. Fiction, yes, definitely. The closest I get to non-fiction are memoirs, which I do enjoy. I agree with Rabid Fox. I heard once that the most effective way to teach youth is "make 'em laugh--teach 'em something--make'em laugh..."